Our area of TN was blasted with a devastating flood since the time I last posted. We were without power for 5 days and without any water at all for 4. Our water is still not usable for internal consumption due to contamination. 44 thousand homes destroyed in Nashville. Many lives lost and damages to property in the millions. I saw things I never thought I would see. Had more than fleeting moments of anxiety for my safety and hours of worry for family and friends. Our personal loss has been minimal. Flooring in our basement ruined. Thanks to friends and family fighting water for three days and three nights with me our sheetrock was saved. Now just drying things out and trying to keep mildew and mold at bay. My Mother in Law was evacuated through the rising flood waters in her yard. Her home is miraculously safe as far as water damage to the inside but her shops, driveway, yard and part of the foundation of her house sustained severe water damage. I was able to take a lot of images over the past week. My emotions were numb most of the time because I was in survival mode. Things like water and food were suddenly of paramount importance. Since TheMan got back from Malawi and everybody is safe I’ve been able to crawl out of my little emotional bunker and FEEL through what happened. Just two miles from our house there are many homes that were destroyed. I want to tell the story of what happened, how it happened but it’s too convoluted. I’ve gotten confused about which days what things happened on. Sleep was scarce for several days and it only added to the surreality of the overall experience. Instead I’ll tell the story of the pictures I was able to take and what I remember surrounding each image. When my Mother in law was Evacuated she was told that her house would probably be destroyed/flooded. As one might imagine this caused a great deal of distress, worry and concern since she does not have flood insurance and did not have time to put anything up high or save much more than her laptop and the clothes on her back. As soon as the rain let up my brother and I in his large diesel truck attempted to go through some road blocks and flooded roads to see if her house had made it through. On Hwy. 50 from Centerville to Columbia we were forced to stop because the water was too high to ford. 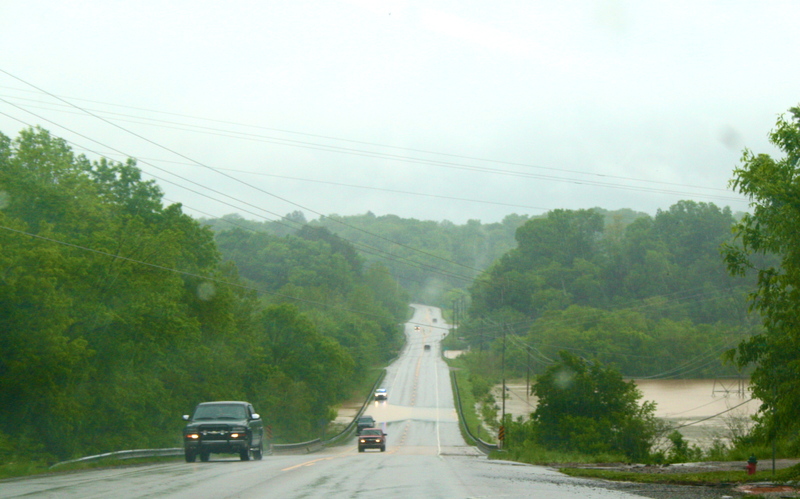 As far as we could see water covered the highway. 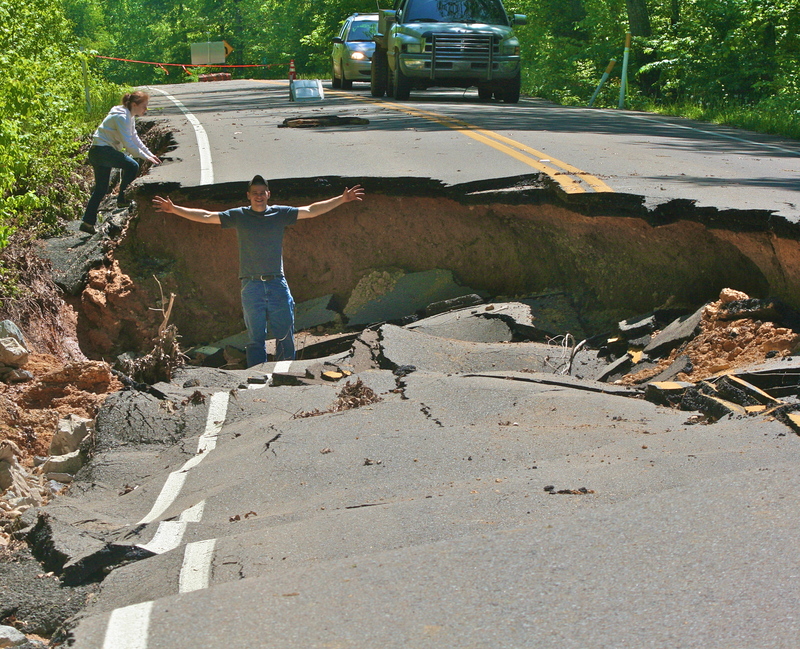 We both felt a sinking feeling in the pit of our stomachs because this was only a couple of miles from my mother in law’s home and her house was at a much lower elevation than the road that was covered over. After we tried unsuccessfully to get through the water I noticed a couple resolutely walking ahead on foot. They slowly slugged through the water staying close to each other. My heart skipped a beat and I felt a surge of anxiety as the woman’s feet slipped or were pulled out from under her by an unexpected current when they were almost around the bend. The man quickly grabbed her upright, she regained her balance and they walked on. The scene haunted me. Why were they risking their lives to walk through flood waters? The one time they looked back at us they looked worn and maybe even a little in shock. I wish I had called to them to see if we could help. 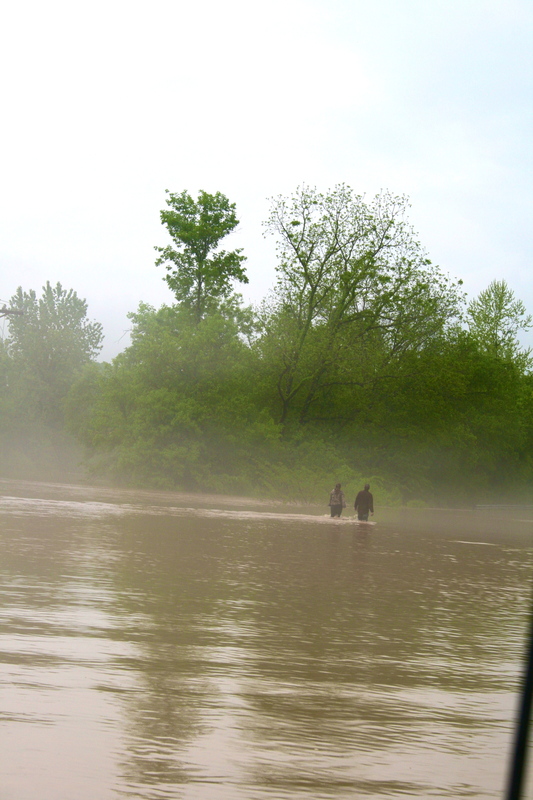 Wish I knew if they made it across the flooded bridge that was just out of our sight. My brother backed the truck up until we could turn around and we headed back the way we came. As we left our house on the expedition to see if we could get to my Mother in Laws home we passed over a section of road that was covered with a low level flow of water. Although the river had risen to almost level with the bridge at that time no barricades were set up and it was still considered safe to drive over. in the photo below you can see the small strip of water. 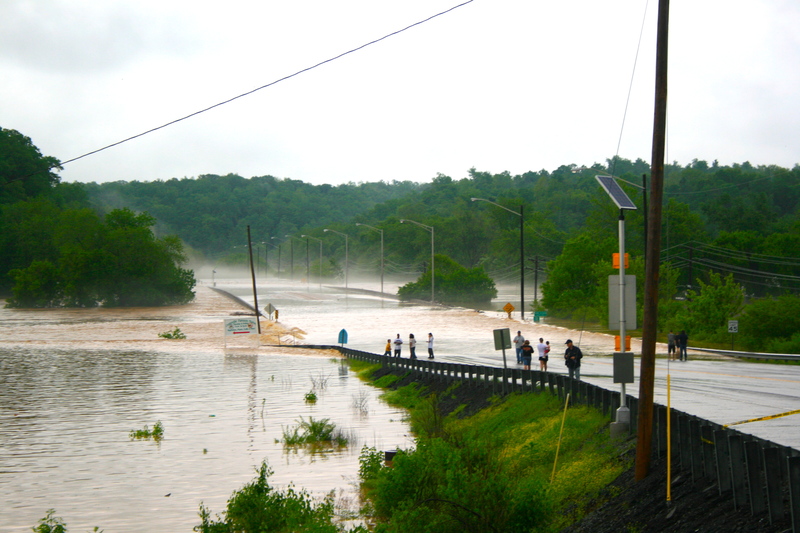 We were not gone for more than an hour and when we returned (this was the final road open to get back to our house) a barricade had been set up and what had been a thin strip of water was now a wide band stretching to the bridge. If we didn’t make it through there was no other way to get to our house and we would be stuck spending the night in the truck with no food, little water and not knowing of a safe place to park…Not to mention being cut off from our house indefinitely. My brother decided to make a run for it, thinking that his truck could still make it through although it was definitely too deep for cars at that point. He by-passed the barricade and drove straight through. I closed my eyes and prayed as water splashed up over the hood. I mentally made plans of what to do if his truck lost traction and began to float, how I would get the Doodlebug out and what we would do to keep her safe. We made it through just fine and very gratefully made our way back home. One of the routes we tried to get back home on was Hwy. 100 coming from Centerville town square and crossing over the large bridge. Typically the water is 40 feet or more lower than this bridge. 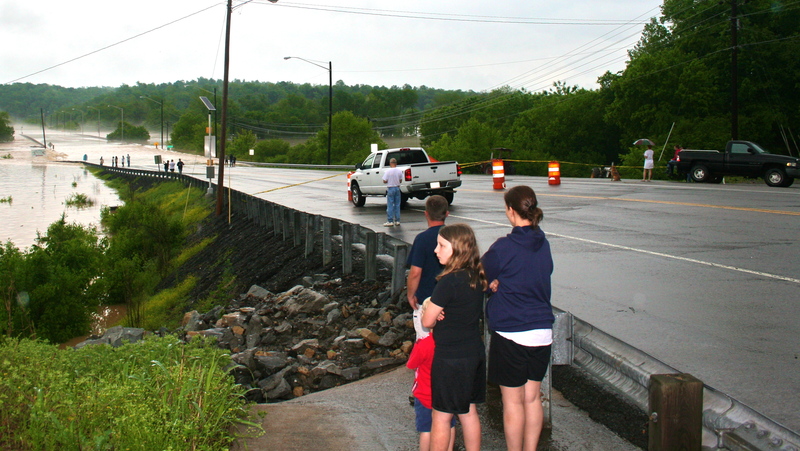 We were shocked to find the water had risen so high it was actually flowing over the bridge. As I stood there taking photo’s of the incredible scene before me I overheard a family near me talking about a family member that was missing. The Grandmother hadn’t been heard from since the flooding began. The families mini van and car couldn’t make it down the flooded road to her house to check on her. Cell phones were not working. Half the phones were down and power was out. A few of the children were crying and the adults faces looked blank and hard. Stoic faces trying to hide the fear they felt from the children. Overhearing some of the discussion two guys with a truck asked which road the Grandmother lived on. The guys had just left their own home with more than three feet of water in it and rapidly rising from there. They quickly offered to see if their truck would be able to make it down the road to the Grandmothers house. If they found her they said, they would bring her back. Tears spilled out of one daughters eyes and the other broke into a spontaneous grin of quick relief. Thank you. Thank you they said. She looks like this. Her name is this. Thank you. You going to find my Grandmother? One of the grandkids asked. We’ll try, they said and jumped in their truck and left. I wish I knew if the truck made it. Wish I knew if they found her. Grateful to have seen a bit of community in action. People caring for people. Belongings and things were suddenly secondary and expendable. Never seen selflesness in action before from normal every day people like I have this past week. It’s humbling. It’s moving. It’s something to thank God for. Worried faces observed the still rising water flowing over the bridge. Body language was tense. Some wiped away tears. Others called to each other asking if friends or family members had been seen and asking about the safety of homes. 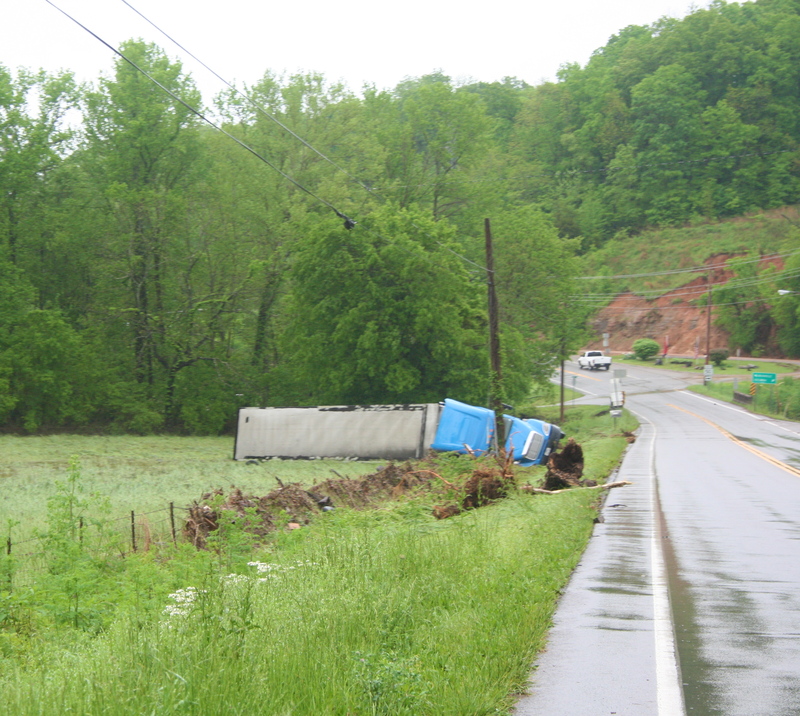 A tractor Trailer was pushed off the road on one of the Hwy’s we tried to get through. 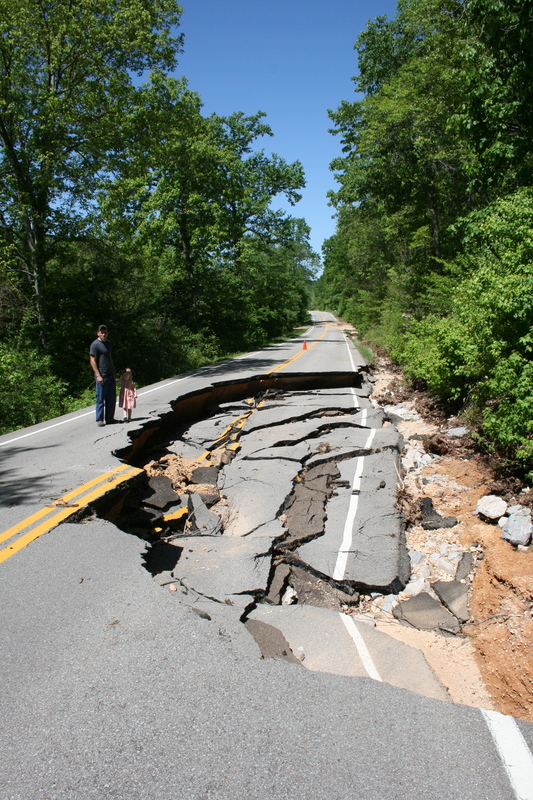 One of the Hwy.’s we travel to pick up raw milk in Cane Creek and to get to our storefront in Lobelville TN was impassible due to an incredibly large washout. My brother is 5′ 10″ to give you an idea of how deep this was. Surveying the damage to see if there is any way around it. There wasn’t unless you had a motorcycle, dirtbike or four wheeler. Many people have asked how a flood would cause a problem like this? The answer is that the water pressure is so extreme from below it washed out all of the supporting dirt/gravel etc. and the weight of the asphault unsupported causes the collapse. 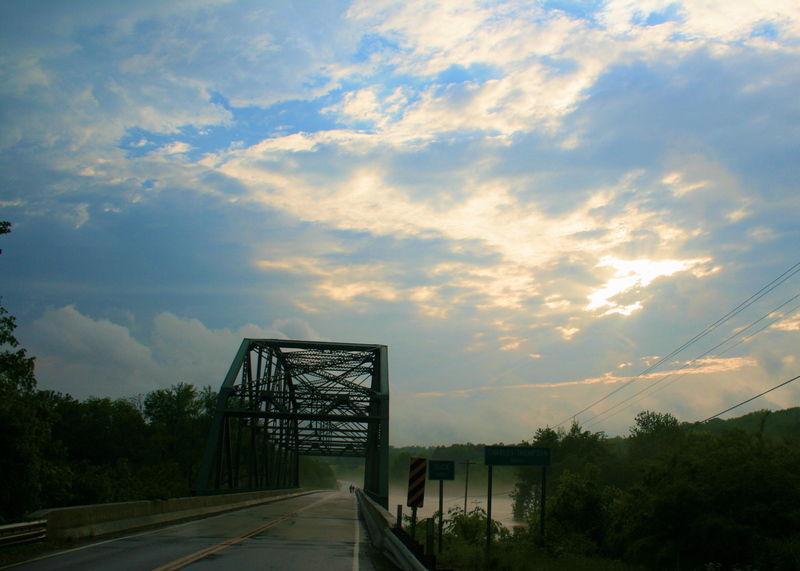 After all the seemingly never ending rain it was such an enormous relief to see sun trying to break through the clouds. There are a lot more photo’s and more stories on my facebook album at the link below. I was able to get a video clip with my iPhone of one of our water adventures. Can be viewed at the following youtube link. And an “after” video when the water levels dropped. Would like to ask for prayer for the many families who have lost their homes and belongings. This area of TN will be a long time healing. My love and appreciation for the incredible people that live in this area has grown tremendously. This youtube clip does a great job showing in a small way the attitude of courage and kindness that the people in Nashville and the surrounding areas have met and dealt with the devastation. Also has far better images than I was able to capture of the devastation in Nashville. thank you for posting about your experience. i can only imagine what you and so many others have been through. i’m very happy to hear that people are pulling together and helping each other. our thoughts and prayers will be with you.